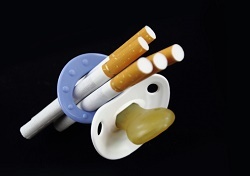 Sudden deaths in babies enrolled on a community-based programme, Care of Next Infant Plus (CONI PLUS), showed avoidable risk factors mostly associated with smoking and place of sleep. The report, published in Archives of Disease in Childhood, documents the outcome of over 6,000 babies enrolled on CONI PLUS; a programme providing extra support to families with young babies. Families are enrolled for a variety of reasons including those whose extended families have experienced the sudden and unexpected death of a baby or toddler or whose babies experience an apparently life threatening event (ALTE). Overall, the numbers of deaths were small, but slightly greater than expected. However, the data suggests the population also has a higher than average risk for SIDS. Of 6,487 babies enrolled, 37 died (5.7 per 1000), 19 babies died following a deterioration in a pre-existing condition, 18 deaths presented as Sudden Unexpected Death in Infancy (SUDI). There were 2,789 (43.0%) babies enrolled because of a previous SUDI in their extended family, six died suddenly and unexpectedly (2.15 per 1000). Four babies were sleeping in higher risk situations at night – sofa sharing or bed sharing with parent(s) who smoked or had consumed alcohol. A total of 1,882 (29.0%) babies were enrolled following an ALTE, five died suddenly and unexpectedly (2.66 per 1000): four unexplained and one due to infection. None occurred while sharing a sleep surface, at least three died during the day. The remaining 1816 (28%) babies were enrolled for other reasons. Seven died suddenly and unexpectedly (3.85 per 1000), 2 were unexplained and none associated with bed sharing. The report found 11 out of 18 (61%) of the mothers smoked and 56% of the mother’s partners were known to smoke. Smoking both during pregnancy and a baby is born greatly increases the chance of SIDS. Sharing a sleep surface with a parent who smokes or has consumed 2 or more units of alcohol is also associated with an increased risk for SIDS.